This was great quality time we spent together. Teach your kids to hunt. You will be so happy you did! There is so much truth in this message. Morel hunting is about families sharing time together and wondering in the woods. It is about teaching and sharing time. It is about moms and dads, kids and grand kids, grandpas and grandmas, and friends with friends – it is about spending time in nature in the hopes of finding the ever-elusive great morel. Morel hunters of all ages can think back and take a walk down memory lane. Reflecting on those people who influenced or introduced us to this glorious pastime keeps those memories alive and well. For many, it truly is a tradition – almost a right-of-passage to growing up. Some can drift back when they were just a little kid wondering in the woods because that is what you did. Many times there are multiple generations tromping through woods and everyone sharing in the joy of yelling – “I found one!” – as everyone else rushes over to help. Most who visit The Great Morel web site can relate to these memories because they are an important part of their lives’. The Stories and Tales page has always been a favorite for many who visit the page and the stories are filled with fellow shroomer’s memories of hunting the often mystical great morel. Memories such as dad throwing you in the back of a Buick station wagon with brown bag lunches of bologna sandwiches or peanut butter and jelly that mom made for the day. The first hiking stick you found that would break if you even decided to use it to support you. The exuberant feeling of being in the woods and finding cool stuff like a slug oozing slime on a giant leaf. Your mom telling you to “get out of the creek”, or grandpa asking you “have you found any yet?” Pure exploration of nature and when you ventured into trouble, someone was there at your side who was quick to tell you “no that is poison ivy”. Remembrances like Betsy’s are not uncommon. Chuck Agnes from Northeast Ohio shared a similar story with what he called “The Briar Bush”. A funny memory of why he believes his father drug them into the woods just so he could win the local morel foraging competition. For those who have been hunting morels for years, there are certainly some whom have been influenced by a Grandparent along the way. Grandparent memories can be some of the fondest memories. Brian from Michigan remembers his Grandpa’s advice “you’ll find more mushrooms in the rain”, and years later he now knows that wasn’t necessarily true, and it was more likely because his Grandpa wanted to hunt – rain or shine. Grandparents have as much influence on teaching the youth as anyone. 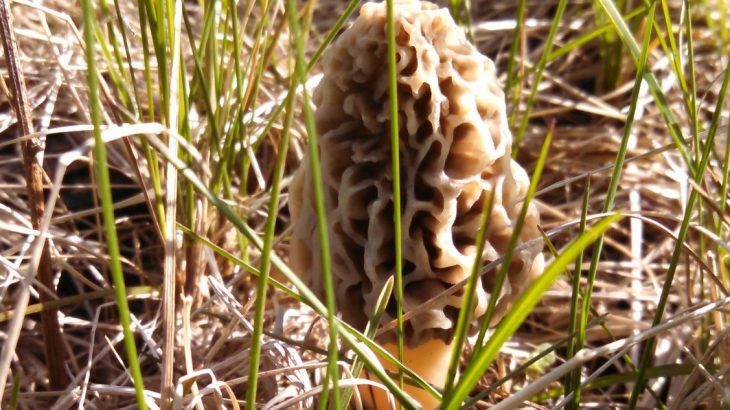 They create those memories with wisdom and a vast knowledge of years of morel hunting experience. As a Grandparent today, you are now trudging through the woods with your grand kids trying to expand their knowledge. Teaching them about all of the things the woods and forests have to share with us. It isn’t always about the hunt for the great morel, it is about sharing wisdom and teaching them about the beauty of nature. It is about life lessons, and a quiet time to share stories and have real conversations. “I remember hunting morels in Missouri with my parents. Now understand, I moved to Indiana when I was FOUR! Just shows what a tremendous impact the “hunting mushrooms” idea had on me! There are thousands of morel hunters who can probably laugh and relate to exactly what Sherry is saying. It is almost difficult to explain to those who have never hunted, yet for those who have, it makes understanding why those memories are so fond. For those who were influenced later in life – it is still your responsibility to teach the youth. For every morel hunter out there – it is your responsibility to teach…to allow the youth to explore and wonder, to let them get lost in the woods, and discover all that nature provides. It is our obligation to instill in them the joys of the simple things in life – to disconnect from the high-tech world and unplug, and expose them to the beauty and allow them to learn. If at the end of the day morels are found – then the time shared is invaluable. …to allow the youth to explore and wonder, to let them get lost in the woods, and discover all that nature provides. Those who have watched a youngster’s eyes light up when they find their first morel is forever memorable. Capturing that moment on film as they show off their prize possession can be priceless. To share high 5’s, and an “atta boy” or an “atta girl”, or a great big hug, and watch the big smiles on their faces light up with self-pride is worth it all. It is the great morel mushroom that makes this all possible. This mystical mushroom which makes its grand appearance for a short moment in time each spring that allows and gives us this opportunity – the opportunity to share time and create real lasting memories. Teach your kids to hunt, you’ll be glad you did. Teach someone to hunt, they’ll be glad you did! For additional reading, check out the Story and Tales page and the Humor and Poems for some wonderful reading. For photos check out the Youthful Shoomers Gallery for the proof of the smiles. Worthy of Reading learning, remember, stories, tales, teach, youngsters, youth. permalink.